Hospitals are busy places that never sleep. They welcome huge numbers of people through their doors, all day, every day, so floors in particular have to stand up to pretty harsh treatment. This means that the right cleaning machines are essential – and Glasgow Royal Infirmary has found its perfect solution in the Truvox Multiwash. The Glasgow Royal Infirmary (GRI) is a large teaching hospital, operated by NHS Greater Glasgow and Clyde. It provides a broad range of regional, supra-regional and national acute clinical services, and has over 70 wards. In addition, it has a busy accident and emergency department, including major treatment rooms for patients with serious injuries, a separate minor injuries unit and a resuscitation unit with six bays. Furthermore with two x-ray facilities all its floors require regular, effective cleaning by equipment that won’t let them down. 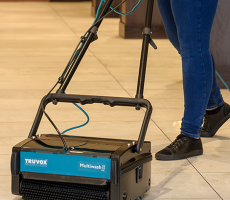 The Truvox Multiwash is a multi-purpose floor cleaning machine that washes, mops, scrubs and drys on both hard and soft floor coverings in one single pass. This versatility makes it ideal for use in hospitals and healthcare settings, where different locations – from reception areas, offices, wards, clinics, treatment rooms and canteens – will have different types of flooring. Any floor surfacing material can be cleaned by the Multiwash, and not just what’s flat on the floor. 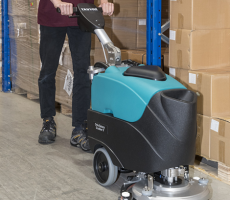 The machine’s optional side brush enables cleaning to ‘skirting board’ level, which is especially important with safety flooring, which tends to curve up the wall before it finishes, and in places like wet rooms. A choice of brushes is available, for normal, maintenance cleaning or intensive scrubbing. “The brushes run at an effective speed and pressure, and don’t cause too much friction, which can sometimes cause damage to specialist flooring,” continues Lesley Davis.